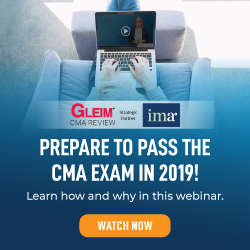 The Student Case Competition is sponsored annually by IMA to provide an opportunity for students to interpret, analyze, evaluate, synthesize, and communicate a solution to a management accounting problem. Soon after Angie Keller graduated college, she began talking with her family and best friends to help figure out her career options. She had just delighted a large group of people with her delicious Peruvian cuisine at her graduation party, so her first thought was to open a Peruvian restaurant. As a nontraditional graduate of her university’s hotel and restaurant administration program, she was aware of the challenges of running a restaurant, including the long hours and high failure rate. After abandoning the idea of a restaurant, she began considering other food-service operations such as catering or supplying specialty items, for example, appetizers or desserts. One idea she considered was selling empanadas. An empanada is a pastry made with modified pie dough filled with various ingredients. The dough is rolled out and cut into three- to four-inch circles. A heaping tablespoon of pre-cooked ingredients is placed in the center, and the dough is folded over the ingredients and pinched closed. Then the empanadas are baked at 350 degrees for about one hour. When there are 15 minutes of baking time left, the pastry is brushed with egg. Ingredients vary but often include meat mixed with vegetables and spices, or even fruit, as well as vegetarian varieties. Different regions of Latin America favor diverse types of empanadas. For instance, pumpkin empanadas are popular in Mexico. Angie had long been told that her empanadas were the best in town, and they travel well. They can be frozen and retain their good quality and taste even after being defrosted and reheated. So she decided to create Angie’s Empanadas, a wholesale food-service company, to sell her empanadas to local restaurants. The company sells three kinds of empanadas: Peruvian (chicken), Argentinean (beef), and vegetarian. The empanadas are assembled in a rented kitchen, with fully cooked fillings. Then they are baked and placed on trays in batches of eight small empanadas. Currently Angie sells trays of the three types for the same price. 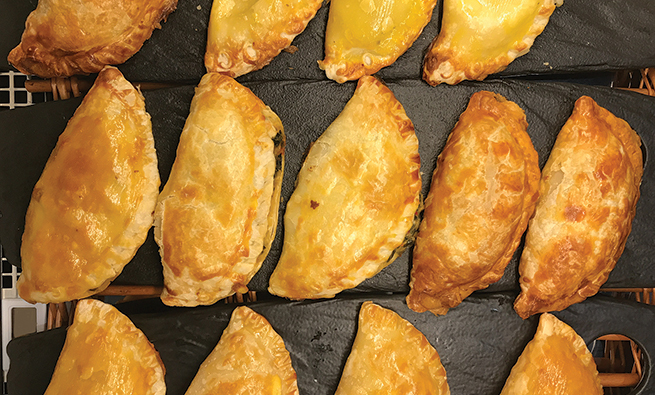 Restaurant clients unwrap the tray, brush the empanada tops with egg wash, and heat them for 10 minutes before serving them as appetizers. When looking to start a business around her empanadas, Angie first considered a large-scale rollout of pre-packaged empanadas for grocery stores and big-box retailers but quickly realized that option was premature. She then decided to explore the possibility of a smaller-scale rollout, selling empanadas to local restaurants. Over the next few days, Angie did some basic research and found that there were about 800 restaurants in the local metropolitan area. Because empanadas are common throughout Latin America, she narrowed the prime target market to some form of Latin American food. She found approximately 100 restaurants that could be classified as Latin American, with the majority identifiable as Mexican restaurants. Of these, she identified 21 as national or regional chains such as Taco Bell and Chipotle Mexican Grill. Angie identified a local chain of seven restaurants as unsuited for the product. This left 72 restaurants that she labeled prime target customers. Digging further, Angie made a second list of non-Latino restaurants and bars that might be interested in her empanadas. Excluding national chains and types of cuisine that were obviously a poor fit, she pared down the list to 130 in total. At the same time, she was perfecting her recipes and estimating costs. She identified a few fully equipped kitchens she could rent for between $700 and $2,000 a month, depending on size, equipment, and location. She also estimated the cost of other items, including ingredients, labor, trays, utilities, and delivery. Then she classified each cost as fixed, variable, or mixed based on the advice of her accountant. 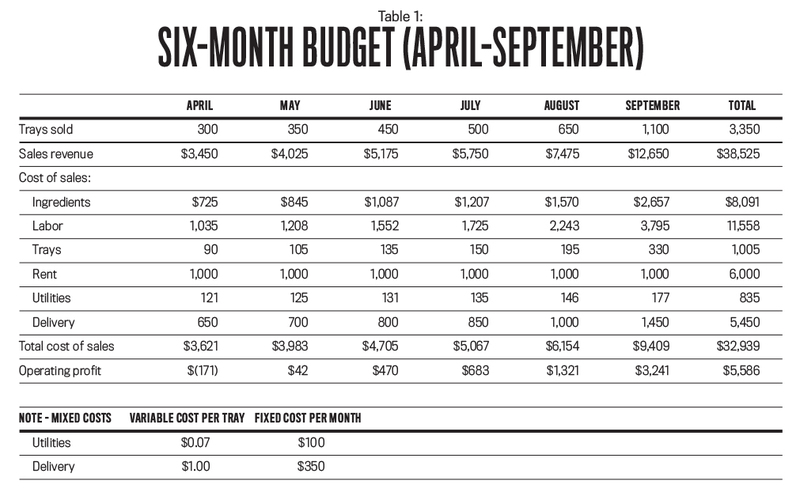 After some additional market testing and interactions with potential clients, Angie prepared a six-month budget (see Table 1). Angie’s Empanadas opened on April 1. The business is located in a metropolitan area with a total population of about 400,000. The area houses a university with approximately 20,000 students, several private colleges, and a technical college. Both the university and the technical college offer restaurant administration degrees. The primary local industries are agriculture and light manufacturing. Angie signed a one-year lease on a kitchen near the university that would provide sufficient capacity and a ready labor supply to help her reach her short-term profit goal of $4,000 per month by the end of the first year. She feels the business needs to make at least that much profit to be worth her time. Otherwise, she will pursue her talent for photography. Angie does much of the preparation and assembly of the empanadas herself, but she hires additional labor as needed, mostly students, to help make and deliver the product. The preparation and assembly is done by hand, and the dough needs to be made daily. This means labor is a relatively large part of the product’s cost. Because the ingredients are organic, they also are relatively costly. Angie relies on quality and excellent taste to differentiate her products, but she’s also trying to keep the price low to gain a foothold in the market. She purchases the trays locally, and they are recyclable but not reusable, meaning she must use new trays for every batch. 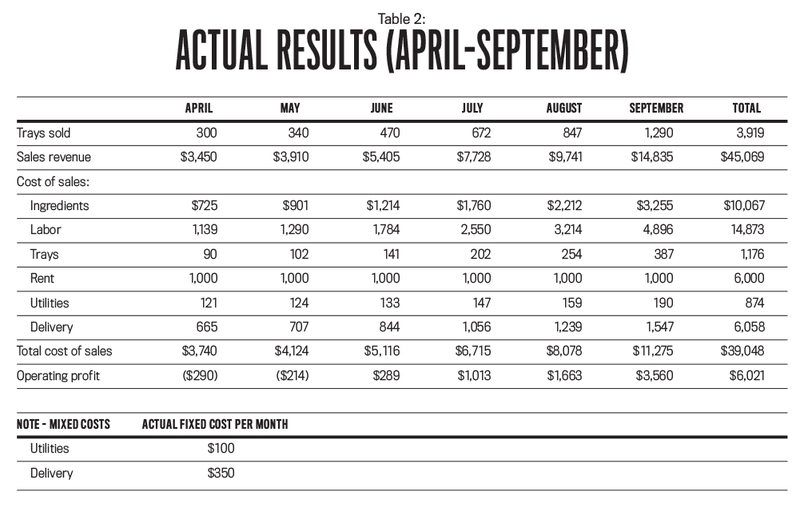 In early October, Angie compared the actual results for the first six months after the launch of her business to her original budget (see Table 2). She had expected to grow her business slowly, so she was excited when she realized that she had sold 569 more trays than budgeted and her profit exceeded the budgeted semiannual profit by $435. She was also delighted by her monthly sales figures, which had exceeded expectations each of the last four months. Based on her early success, Angie is thinking of expanding her operation to a larger space and investing in kitchen equipment as well as other assets, such as delivery trucks. But her part-time accountant isn’t as excited. 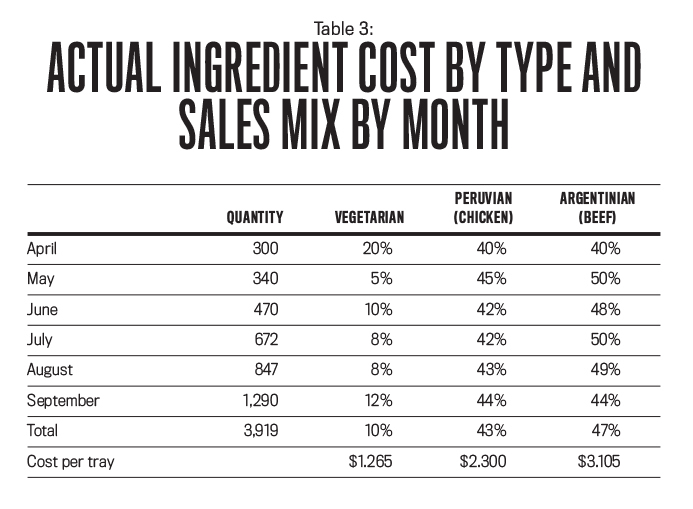 He did some additional analysis across the three types of empanadas and found that the overall cost per tray for each type differs significantly (see Table 3), yet they are all priced the same. He doubts that she could reach her goal of $4,000 a month in profit by the end of the first year without making some price changes. Angie recently received an inquiry from one of her customers, a local organic restaurant and catering company, asking for special pricing for large-event orders. Angie previously provided the customer with an order of 50 trays of empanadas in September. The catering company picked up the trays at Angie’s kitchen, saving delivery costs, and said it would continue to do so. The customer would standardize its order at 40% vegetarian empanadas, 40% Peruvian, and 20% Argentinian, but it would also require a more expensive tray ($0.75 per unit vs. the current cost of $0.30) that can double as a serving dish. This customer would also provide extended lead times for the orders. Angie doesn’t expect that the additional orders would impact her other customers. She sees this as a good opportunity but is unsure what price to quote this customer so that both sides would benefit. 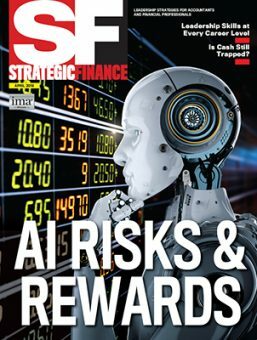 Angie recognized that she needs some professional help and hired your consulting team to advise her on financial planning and analysis to evaluate the first six months of operations. She also wants advice on how to reach her profit goals. Given Angie’s budget and profit goals, suggest which metrics Angie should use to assess the success of her new venture. Prices and costs are per tray, so use trays as the basic unit when determining per-unit amounts. Analyze and compare Angie’s overall actual results with her expected results to determine why her accountant is concerned. Angie’s accountant recommended that your team drill down further into the sales mix and cost figures to determine how the different product types are affecting profits. Look for any sales-mix issues and suggest potential solutions. Offer suggestions for how Angie should determine a price quote (per tray) for the special-order customer. Offer suggestions to improve Angie’s operations and to help her decide whether to continue the business and, if so, how to grow it. Consider potential alternative products, services, and marketing options. Craig Keller, CMA, Ph.D., who passed away on April 27, 2018, was a retired member of the School of Accountancy at Missouri State University in Springfield, Mo., and was most recently an associate accounting professor at Woodbury University in Burbank, Calif. He was a proud member of IMA. Craig’s passion for teaching management accounting, and his wife’s love of cooking, provided the inspiration to develop this case study. Michael R. Hammond, CPA, is a senior instructor in the School of Accountancy at Missouri State University and a member of IMA’s Greater Ozarks Chapter. He can be reached at (417) 836-5061 or mrhammond@missouristate.edu.